Jamaica, 1976: Seven men storm Bob Marley’s house with machine guns blazing. The reggae superstar survives, but leaves Jamaica the following day, not to return for two years. 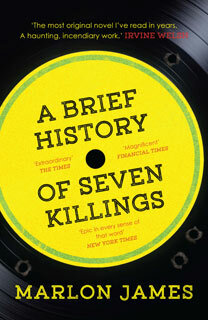 Inspired by this near-mythic event, A Brief History of Seven Killings is an imagined oral biography, told by ghosts, witnesses, killers, members of parliament, drug dealers, conmen, beauty queens, FBI and CIA agents, reporters, journalists, and even Keith Richards' drug dealer. Marlon James’s dazzling novel is a tour de force. It traverses strange landscapes and shady characters, as motivations are examined – and questions asked – in a masterpiece of imagination.